Did you know that the Yellowstone National Park is actually the caldera of an ancient supervolcano? The last time it erupted was 640,000 years ago. Ashfall answers the question, what if the super volcano known as Yellowstone National Park blew up today? Alex thinks that it's going to be just another weekend in Iowa suburbia. He’s playing World of Warcraft while his folks are away visiting family. What he doesn't expect is his house to catch on fire because of a super volcanic eruption thousands of miles away. The cataclysmic events that ensue describe a frightening world covered in a layer of deadly ash. The violence, in the world after the supervolcanic eruption, is described through Alex's experiences. It isn't long, after the deafening noise which lasts days, that he sees a man kill another for food. Alex realizes that to survive, he needs to be willing to protect himself, and utilizes his martial arts training to get by in this new unfriendly world. The ash that has fallen, is so thick, Alex has to use his father’s skis to traverse the new grey and cold landscape. As he makes the trek out to find his family, he comes across many kinds of people. There are people working together to provide some kind of structure and order, and others who are looking only out for themselves, and will murder and plunder to maintain their survival. The character development is well done. Alex is just like any another World of Warcraft obsessed kid who has to grow up in the face of immense adversity. Darla, a farm girl, who has a way with machines is another character that blossoms in a beautiful way. As the world plunges into a potentially endless winter, the love the two characters have for each other, in this wasteland of snow and ash, grows. It’s a refreshing romance that’s not littered with over the top saccharin. This book will engross the reader with its ability to frighten and show very real threat to humanity. And the threat is not so much focused on a cataclysmic event which could occur, but rather it shows what American society could be like if infrastructure collapses. How will people communicate? What will they do for food. Will people choose to help or to hurt each other? Ashfall looks at all of these questions and gives some shocking answers. Violence, politics, love, relationships, hunger, starvation all are major themes, and the author is able to weave them together flawlessly. The book will make you cringe, it will bring you sighs of relief. You will smile and laugh, and you will hurt when the characters hurt. It will keep you on the edge of your chair, and you’ll want to know how it all turns out. This is a great book for any readers of dystopian or post-apocalyptic literature, and it is a valuable contribution to the blossoming “cli-fi” or climate fiction genre. 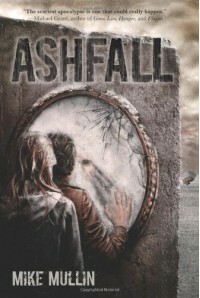 The book is part of a series, and Ashen Winter picks up where Ashfall leaves off. This one is definitely worth the read.